Clinic, phone or Skype consultations available to guide and support you with all your healing needs. Intuitive insight combined with a range of modalities, to clear, heal and empower your body, mind and spirit. Specialising in emotional healing and Soul Integration. Call today for a free phone consultation, to find out how Diamond Light Healing can be of assistance with all your healing needs. 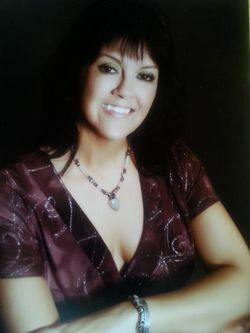 Intuitive Healer, B.Msc.,Reiki Master.NLP Practitioner, Sacred Rainbow Colour Therapist. Energy healing addresses the cause of the dis-ease (which is generally a trauma) and the resulting toxic emotions that separate the person from his or her joy and health. The cause of the dis-ease is due to the imprints of trauma stored in the Light body. It is a person's Luminous Energetic Field that registers "scratch marks" of trauma that are repeatedly triggered. 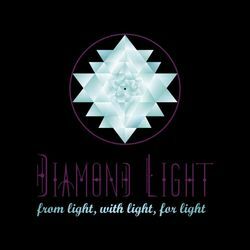 Diamond Light Healing offers vibrational therapies to assist with clearing, healing and empowering the Human Energy System. Within this nurturing, supportive healing space you can integrate harmony within body, mind and spirit. 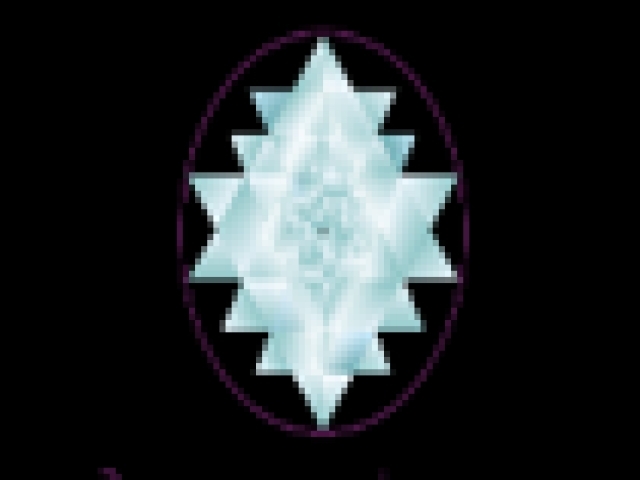 The services provided are focused on assisting you to re-balance, re-store and replenish your own unique Divine Light. Once Harmony is established within your Energy signature, your Soul's essence is able to return to its true expression and purpose. 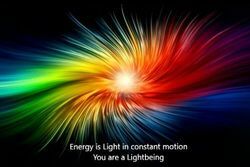 With intuitively channelled light vibrations & frequencies, sacred geometry & colour the individual is aligned, centred and balanced. 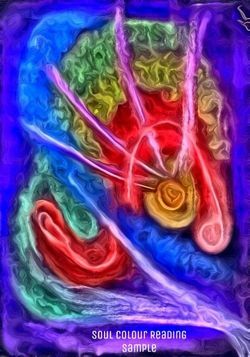 Intuitive insight is channelled in all healing sessions. With the combined focus and intent of healer and client, energetic shifts can be facilitated with ease and grace. The return to balance is gentle, yet deeply profound and felt at the deepest level of being. It is with Love, Honour and Respect to the Divine Light essence within you that this healing space is manifested and sustained. "Look with the eyes of your Soul and engage the essential." 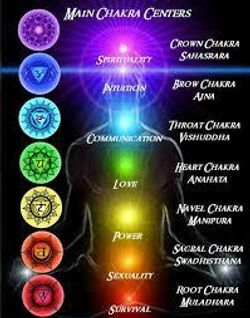 Clear, repair, balance and infuse the Chakral system with the necessary light quotient for optimal health. May include clearing/ healing of psychic chords, attachments and energetic entities that no longer serve the Souls highest good. Clear, repair, replenish and harmonize the etheric bodies. May include clearing/ healing of subconscious and subliminal imprints, limitations, belief systems or programs that no longer serve the Souls highest good. 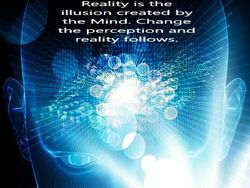 Clear, heal and resolve compromised perceptions, projections and interpretations of experiences that have resulted in emotional disharmony. Clear, heal and delete emotional trauma and wounding experienced in childhood and past life experiences. Resolve behavioural patterns and memories stored within the energetic structures that no longer serve the Souls highest good. 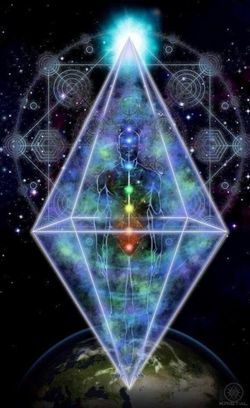 Soul level energy facilitation to awaken and empower the Crystalline, Diamond and Light Language structures, keys and codes. For the awakening Soul ready to actualise their 5D Master Self within their current 3D embodiment. All healings are tailored to your specific needs and level of awareness. Healing takes place at the comfort level and pace that is perfectly aligned with you, and which best serves your Soul. *It is recommended that 3 consecutive sessions are undertaken to attain maximum benefit. This allows your energetic system time to reveal, process and resolve core issues limiting your infinite potential. Soft pastel colour reading/ interpretation of the Souls strengths and challenges. Learn how and why you react and process your life experiences as you do. The information channelled in these readings allows you to understand your subconscious patterns, behaviours and coping mechanisms. Once revealed you are then equipped to retrieve empowerment and expand your awareness beyond your current limitations. A4 channelled art includes Light language activation code/ healing symbol and written analysis. Only name, date of birth and email required. Easily downloadable PDF format. Are you ready to experience your Infinite Potential? HEAL physically, emotionally and spiritually with a range of modalities including Energy work, Reiki, NLP and Colour Therapies. Carol intuitively repairs, restores and replenishes your Energy Bodies and Chakras to alleviate stress, pain and emotional disharmony. AWAKEN your dormant and unlimited energy resources available to you with easy tools and exercises. Learn practical procedures that will energise, revitalise and strengthen your body, mind and spirit. EXPAND your self-awareness and discover your energy systems, how they affect you and how to better interact with the world around you. EMPOWER yourself with easy techniques that can be used anywhere anytime to experience an abundant and positive life. Learn how to enjoy your daily life free of struggle. TRANSCEND by regaining control of your energies, reconnecting with your true essence and revealing your true passion and purpose in life. Flourish beyond your limited 3D self into the Master Creator that you are. 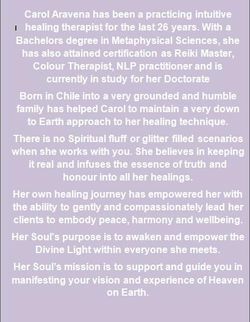 I have known Carol personally and professionally for many years, initially through meditation groups and energy work treatments. Whenever I felt particularly stuck in my progress, I knew it was time for a 'tune up ' with Carol. Recently a major health issue and spiritual malaise found me on Carol's healing couch again. Over 3 sessions, Carol helped me identify and shift energies surrounding this issue and others holding me back from progressing in my personal, financial and spiritual life. Through a gentle, though sometimes emotionally challenging and cathartic process including clearing and healing the energy bodies and chakras, meditations, timeliness and focused intention, Carol and her spiritual team guided me to deeper insights. I was able to begin releasing blocks, thought patterns and beliefs, allowing me to find lost enthusiasm, energy and self-awareness. I felt the experience with Carol to be renewing, supportive, non-judgmental and insightful. I particularly appreciated her down to earth, straight talking approach. 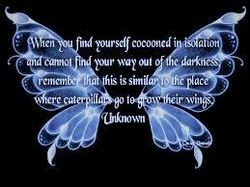 If you feel similarly lost on your path make a worthwhile investment in yourself and let Carol help you shine some light. You won't regret it. Thank you, Carol, for the vital and awesome spiritual work you were born to do!